12 A None No Power Seat 12 A is a standard Economy Class seat, however, this seat does not recline due to the exit row behind. 12 B None No Power Seat 12 B is a standard Economy Class seat, however, this seat does not recline due to the exit row behind. 12 C None No Power Seat 12 C is a standard Economy Class seat, however, this seat does not recline due to the exit row behind. 12 D None No Power Seat 12 D is a standard Economy Class seat, however, this seat does not recline due to the exit row behind. 13 A None No Power Seat 13 A is a standard Azul Space seat located at the exit row with additional legroom. 13 B None No Power Seat 13 B is a standard Azul Space seat located at the exit row with additional legroom. 13 C None No Power Seat 13 C is a standard Azul Space seat located at the exit row with additional legroom. 13 D None No Power Seat 13 D is a standard Azul Space seat located at the exit row with additional legroom. 26 B None No Power Seat 26 B is a standard Economy Class seat. The proximity to the lavatory and the galley might be bothersome. 26 C None No Power Seat 26 C is a standard Economy Class seat. The proximity to the lavatory and the galley might be bothersome. 27 A None No Power Seat 27 A is a standard Economy Class seat. This seat is in the last row and does not recline. The proximity to the lavatory and the galley might be bothersome. 27 B None No Power Seat 27 B is a standard Economy Class seat. This seat is in the last row and does not recline. The proximity to the lavatory and the galley might be bothersome. 27 C None No Power Seat 27 C is a standard Economy Class seat. This seat is in the last row and does not recline. The proximity to the lavatory and the galley might be bothersome. 27 D None No Power Seat 27 D is a standard Economy Class seat. This seat is in the last row and does not recline. The proximity to the lavatory and the galley might be bothersome. Azul's E-190 offers two by two leather seating and individual inflight entertainment monitors at every seat. Azul was the first airline in Latin America to feature inflight entertainment monitors at every seat on all of its jets. Seating on Azul's E-190 includes 84 regular economy and 22 Azul Space seats providing an additional 3 in/8 cm legroom for an added fee. 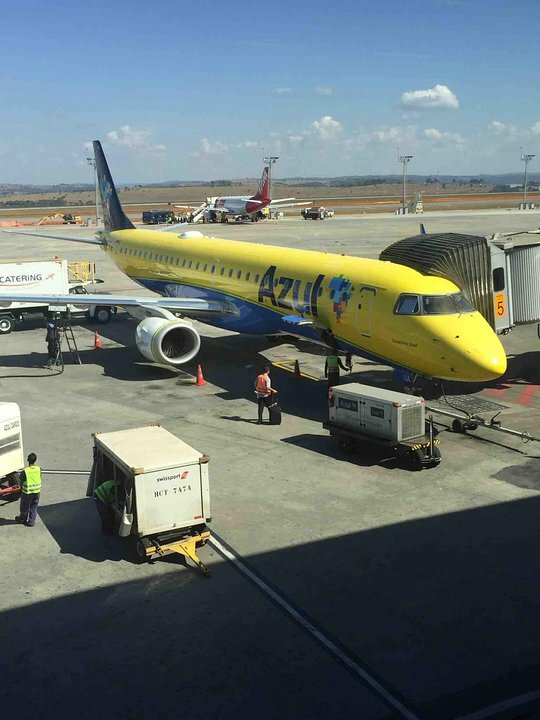 Azul flies 1 versions of ERJ 190.